Disclaimer: As a North Londoner who’s moved South and rarely visits West, I did not stumble upon this post’s restaurant perchance; it was the review of the great Jay Rayner that led me there. Read his review here. Italian food is hard to dislike. Pizza, pasta, flavoursome tomatoes and gelato galore, this is a cuisine which can tempt even the pickiest of eaters. It’s seen a bit of a revival of late, moving away from the sea of soulless Bella Italia-esque chain options and into the kitchens of many exciting and trendy small-plate serving central London restaurants (see: Bocca Di Lupo, Polpetto). 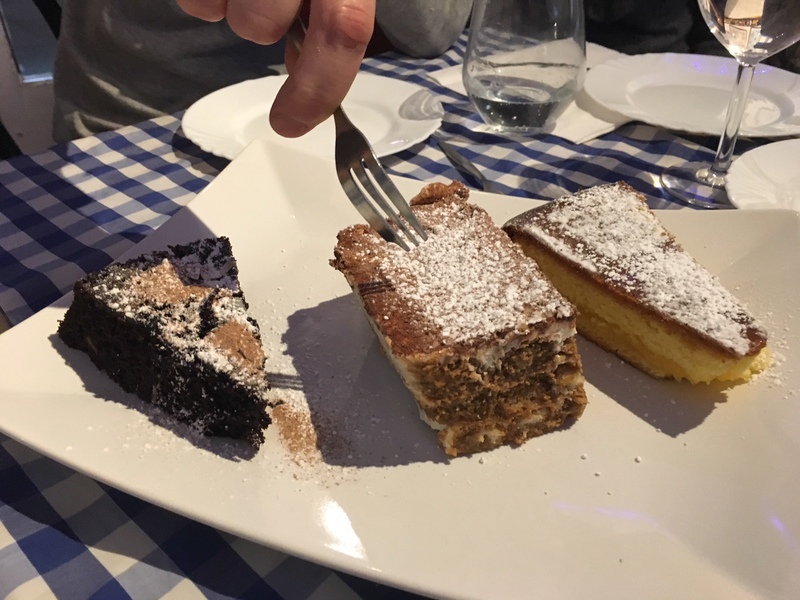 Neither a fancy mini-plate affair or part of any kind of chain, Da Maria in Notting Hill offers up Italian food untouched by trends or franchises. Proper, home-cooked Italian meals made by someone’s Nonna (called Maria, you’ll be surprised to hear) are served on red and white wipe-down table cloths, in a tiny narrow restaurant that seats about 25 people max. 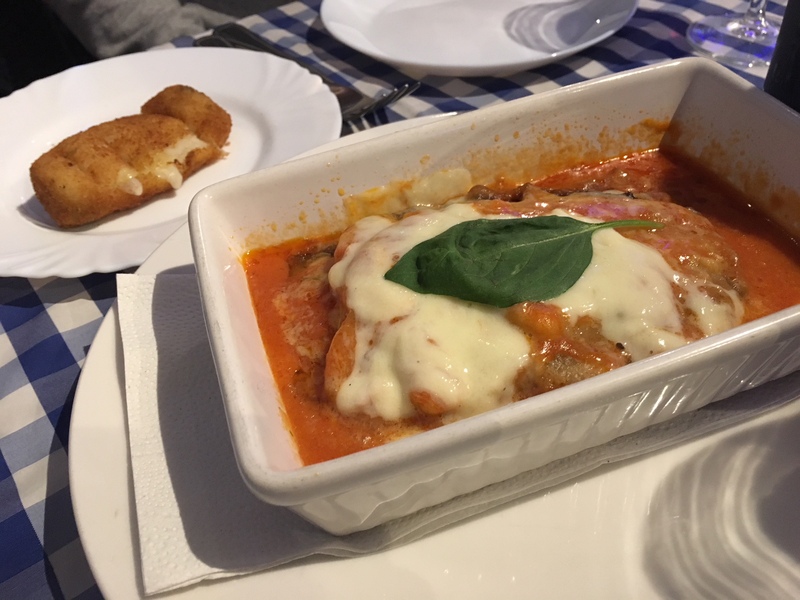 The food is inexpensive (the most costly dish is a chicken Milanese at £13, with most main dishes between £6-£9) and the service is full of smiles, strong Italian accents and real Neapolitan spirit. Eating with a group of Argentines, who if they had it their way would have supper at midnight on a school night, we sat down slightly later to eat. A 9:30pm start meant we had missed the arancini and had to divide the last remaining potato croquette in five. But oh, what a fifth it was! Whipped mashed potato mixed with cheese and coated in a crispy breadcrumb, this starter embodies carbohydrates done right. We accompanied this with a aubergine parmigiana to share, which was equally well received; the aubergine was silky soft without being oily, topped with fragrant tomato basil sauce which mixed perfectly with the layers of cheese. Main courses on offer include Neapolitan pizzas, pasta plates and bakes, with meaty options such a chicken cacciatore and meatballs with roast potatoes. Clearly fans of cheesy pasta bakes, my partner and I shared a lasagna and cannelloni between us. 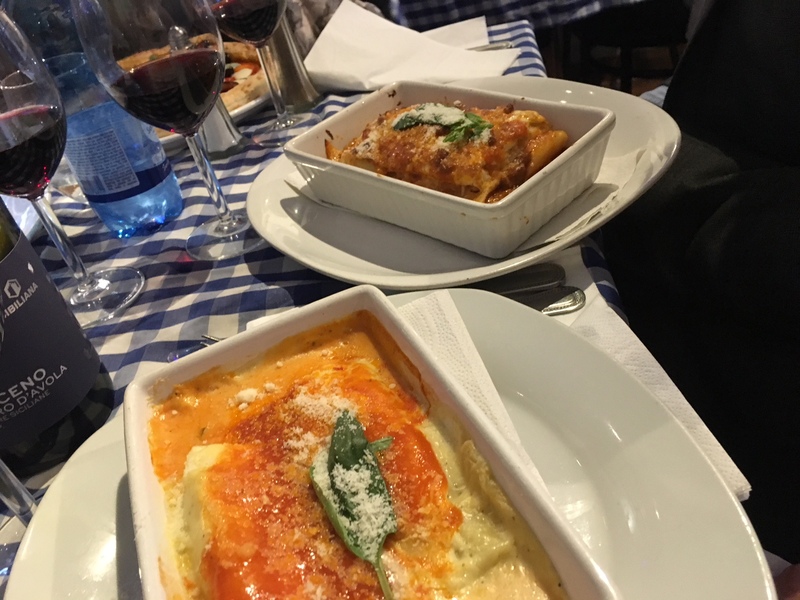 I expected bechamel sauce in my lasagna (and would have been positively upset if it didn’t feature), but was surprised to see it on top of the spinach and ricotta filled cannelloni. Combined with the already rich filling, I though the cannelloni would have benefited more from a slightly lighter sauce. The lasagna, rich but rightfully so, was therefore the preferred dish; glorious, meaty oil oozed out of its layers and mixed into the bechamel sauce (no complaints about its presence here). For pudding, sadly the Neapolitan cheesecake had run out (another reason to arrive earlier! ), but we were amply substituted with a selection of lemon cake, Caprese cake (chocolate and almond) and tiramisu. The lemon cake was sweet with a counter citric twang, and the chocolate cake, with bashed up amaretti biscuits inside, had a great flavour but crumbly texture, which could have benefited from some cream on the side to smooth it altogether. The star of the show was the tiramisu, constructed with delicate lady finger biscuits that held their structure despite the drenching of coffee and booze. Sandwiched together with a mascarpone cream, this was the perhaps the best I’ve ever had. All these puddings were topped off perfectly with complimentary servings of limoncello. This is the kind of hospitality that keeps their customers coming back… along with the outstanding lasagna and tiramisu. And really, why would you go to an Italian restaurant to eat anything else?